I have been experimenting a little with a new power toy called Deep Zoom Composer, released by the Microsoft Expression and Design Team. 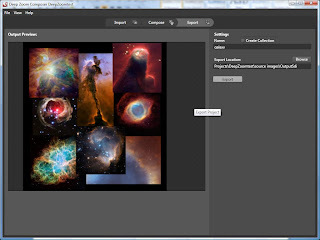 This simple but powerful tool lets you import large scale images, make compositions with them and then exported to a collection of images that you can integrate in your Silverlight 2.0 applications to implement the Deep Zoom technology, which I think is great. 2 - Compose: make the composition with your imported images. You can make compositions of one or several images. 3 - Export: export the composition to an output directory, so you can then import it to your Silverlight 2.0 Applications. You can export the final output as either a Deep Zoom Image or Collection that can be fed into Silverlight's MutliScaleImage control, which is the one you have to use to implement the deep zoom technology into your app. I'll make more post regarding the Silverlight 2.0 MultiScaleImage component and the use of Visual Studio 2008 and Expression Blend.